It sure is another wonderful time of year! Mamas, we can all relate. As fun as Summer is, we welcome Fall with open arms and open car doors for the kids. And back to school style is for more than just the kiddos in my book. But I am sure you already guessed that. Really any excuse to shop and Im all over that. HA! For me, I still have to walk my daughter into her preschool and the running joke is I am either homeless or hot. No, I am not full of myself thinking I am hot and all that, but you're either a mess or put together and I like homeless & hot for descriptions sake. Whether you're doing drive drop-off, walk-in or watching the am news waiting for the kids to walk off, here are my 4 simple dressing tips to have you looking put together in an instant for back to school fashion. 1. 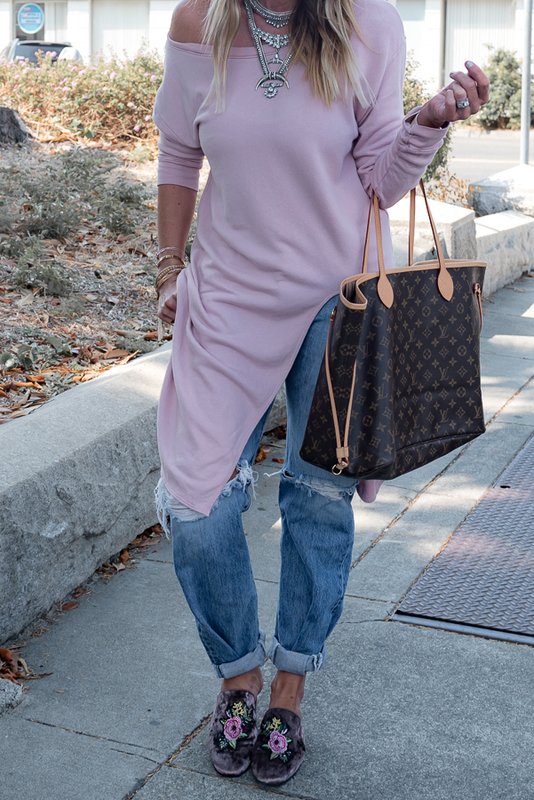 Simple Top: this pullover/tunic is actually a side tie top, but I untied it and left it long, changing up the entire look of the top. Don't ya just love a double purpose item?! 2. Jeans: Any pair of jeans will do. Mine are vintage Levi's but I love these and these ones. Again as I mentioned in this post, the key to your outfit looking good and simply put together is balance. If you have a larger, roomy top, think skinny jeans on bottom and vice versa. I promise it balances out your look every time. 3. Flats/Slides/Mules: These type of shoes are super in for Fall and easy to slip on and walk around in. Plus, with all the embellishments these days they look extra cute and amp up any simple jeans and top outfit. I am so loving these Embellished Mules and happy to report that almost all sizes are re-stocked. I also have and love these and this pair too! 4. Large Sunglasses: Whether you want to hide the no-makeup or just look like you're famous, throwing on a huge pair of sunglasses is key and winning! I especially love this pair I got for $12. I also love these aviators and these new shields I am on a waitlist to re-buy, ugh.